Join me in supporting the food artisan movement in South Florida, in general food artisan products are unconventional, not always bound to culinary rule or based on trends but rather a pure joy to cook, prepare, bake or produce unique edible treasures that are as unique as the food artisans themselves. I appreciate this food movement and the ideas bouncing around here in South Florida; and for the most part anchored in the use of locally sourced organic ingredients. Overall Food Artisans care about the people they feed, and the environments from which their food is made; with love and close attention to detail, with quality in mind rather than quantity or mere profit. 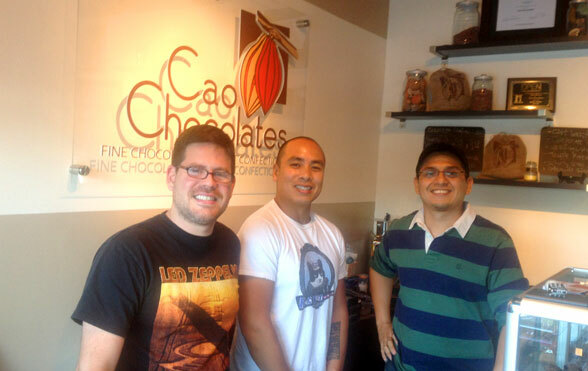 In this post I feature three food artisans, all of which can be found at Cao Chocolates — located at 9804 SW 77th Ave in South Miami. However you can also find them at local farmers markets and select retail stores. Offers: Artisan hand crafted chocolate confections made with 100% single bean Venezuelan cacao. Gourmet chocolate confections. What would you like people to know about your product? All our confections are hand crafted in small batches, using mostly local ingredients from farmers and other local businesses. Because chocolate is a product that we’ve been always passionate about, and we love the ways we can express different kinds of art and emotions with this product. The quality of the Venezuelan cacao beans we use is top of the line, providing incredible flavors and aromas that we carefully pair with different fruits, teas and liquors. Do you deliver? Where to? Yes. Hand Delivered within Miami Dade and Broward County. We also offer nationwide shipping. Do you have a facebook page? Twitter page? Instagram? Or other? Offers: Ice cream and sorbet that’s like having a punk rock, hip hop, electro dance, heavy metal, funky love child, body rockin’, smooth jazz, drum & bass palate-palooza concert playing on your taste buds. Image Courtesy of RocKatIceCream Co.
Roc Kat ice creams and sorbets are locally made in Miami and our flavors are as varied as our musical tastes! Roc Kat ice creams and sorbets are hand crafted locally in Miami and in small batches. We pride ourselves on coming up with unique flavors that our customers have never experienced before! Offers: An array of great flan flavors like chocolate, vanilla, cortatdito/cafe, dark chocolate, passion fruit, guava, dulce de leche, pumpkin, sweet potato, coconut, cheese and more to come. I started this product because my abuela (grandmother) spoke to me in a dream. I had been praying wanting a change in my life, I just didn’t know what. My abuela raised six daughters baking one of her specialties; flan de chocolate. I am always grateful to have spent time with her in my most important years of my life. In that time she gave me lots of great advice and knowledge for my future and she taught me how to make flan. Every time I bake I feel that I am with my abuela and her memory inspires me to make new flavors. I feel as if she is proud of me for sharing her legacy of amazing delicious flan. Doral Farmers Market located on 9659 NW 41st Street every Sunday from 10am-3pm or at Cao Chocolates 9804 SW 77 Ave Miami Fl 33156. Loved this post! (I always read all of your posts to keep up with food related places in Miami) Thanks for keeping us updated on these unique eats in Miami. We will surely pay a visit to these vendors. 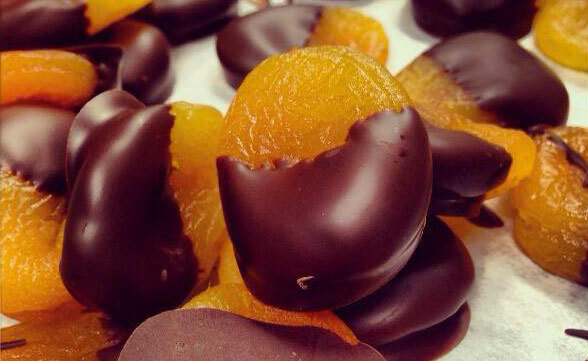 I am not dreaming about the photo with the oranges and chocolates and it is only 10 AM on a Monday! Thanks Grace, glad you loved the post.. your feedback is always appreciated! Have an awesome week.